After Vapexpo, Vapevent, the E-cig Show, e-cigarette lounge or the Vapecon France, this is a new show dedicated to the electronic cigarette that will land in France next year. The B2Vape Exhibition wants to be a human-sized salon and a future business facilitator. 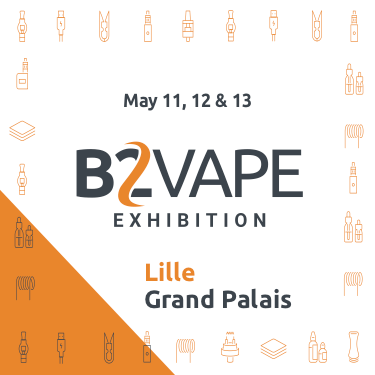 B2VAPE EXHIBITION: THE 11-12-13 MAY 2019 IN LILLE GRAND-PALAIS! For years, there has been no real competition in the e-cigarette industry. Whether it's the E-cig Show, the Vapecon France or the e-cigarette show, none has managed to establish itself as a competitor of the Vapexpo (and this for various reasons). Yet a newcomer arrives today and intends to lead a new project to its end: B2Vape Exhibition. If very little information has filtered for the moment, we know that the first show should take place on 11-12 and 13 May 2019 à Lille Grand Palais. According to the organizers, the B2Vape Exhibition is a human-sized fair dedicated to the electronic cigarette market in France that will offer two days to professionals and one day to the public (Discovery Day). Visiting or exhibiting at the B2Vape Exhibition is giving yourself every opportunity to position your company as a key player in the marketplace and forge new business partnerships or consolidate your existing relationships. Because the world of the vape is done primarily by its users, we do not leave them in rest ... We are organizing a "Discovery Day" entirely dedicated to individuals on Saturday 11 May 2019. The opportunity for the general public to participate in a large gathering of vapers, to exchange between enthusiasts, to meet other members of the different communities and especially to discover the latest novelties and innovations in cash and equipment. The uninitiated wanting to leave smoked tobacco for the electronic cigarette will obviously be well received and advised as it should. For exhibitors, this "Discovery Day" is an opportunity to unveil its latest nuggets to the general public! The 12 & 13 Mai 2019 days will be entirely dedicated to professionals. B2Vape Exhibition is forbidden to minors. We do not mention any economic advantage or promotional advantage over the price of the different products. B2Vape Exhibition does not suggest that an electronic cigarette is less harmful than a traditional cigarette and we do not encourage smokers or non-smokers to consume these products.